ALIVE! 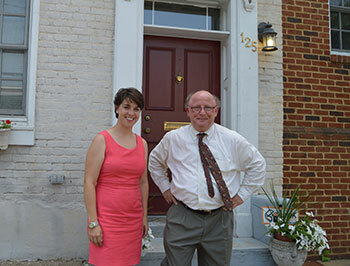 House Director Amanda Issac and Housing America Task Force staffer John Bohm. 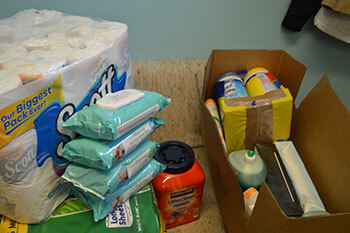 Toiletries and cleaning supplies were provided to families. Housing America is a campaign that aims to raise national awareness of the need for and importance of safe, quality, affordable housing through education, advocacy, and empowerment. ALIVE! (ALexandrians InVolved Ecumenically) is a 501(c)3 nonprofit organization of volunteers from over 40 religious congregations and the community working together to help those in need in Alexandria, Virginia. NAHRO, established in 1933, is a membership organization of 23,000 housing and community development agencies and professionals throughout the United States whose mission is to create affordable housing and safe, viable communities that enhance the quality of life for all Americans, especially those of low- and moderate-income. NAHRO's membership administers more than 3 million housing units for 7.6 million people.